Description: In today�s postfeminist, post-structuralist milieu, feminist biblical studies�despite its now well-established place in the discipline�can seem out on a limb, too narrowly concerned with the interests of women: women in the text, women in history, women readers. Its connections with studies in masculinities, with queer theories, with lesbian and gay studies may appear thin and flimsy. As the current terminology shifts perceptibly to �gender criticism�, this book examines the continued place of feminist biblical studies within the discipline. Is it now the time, Deryn Guest asks, for feminist biblical scholars to resist more strongly than ever the threats of a diluted feminist agenda and feminist politics, the erasure of women�s concerns from public consciousness, the loss of autonomy for feminist space? Or is it the time to make a definite shift and abandon the language of �feminism�? Readers of this scintillating volume will find themselves invited into a sophisticated discussion of the question as they consider how far feminist biblical scholarship should be more inclusive of the newer critical voices emerging from trans- and intersex studies, testing the extent to which it can examine the construction of heterosexuality and make the apparatus of biblically prescribed heteronormativity an object of critical study. The book closes with the intriguing possibilities available for �queer straight� practitioners of biblical studies with an armoury of genderqueer strategies in their hermeneutical toolbox. 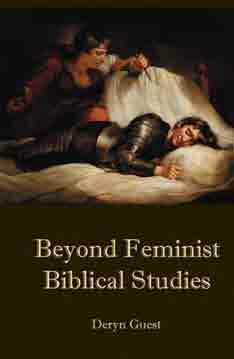 Citation: Amelia Freedman, review of Deryn Guest, Beyond Feminist Biblical Studies, Review of Biblical Literature [http://www.bookreviews.org] (2014).